At the beginning of September, Revd. Mark Rudall stepped back as senior chaplain in the Surrey & Hants area and handed over to Tina Osborne. Mark will be continuing as a WWC and focusing on his journalistic skills to improve WWC profile in the secular and Christian press. 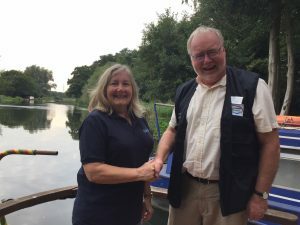 Tina brings much to the role of senior WWC as a Licensed Lay Minister in the C of E, long term leisure boater and having recently retired from running her own business. She is supported by her husband James who is a probationary waterways chaplain.